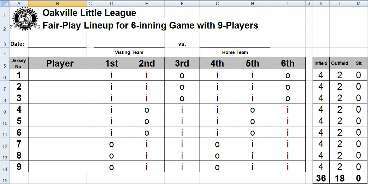 The OLL Fair Play Line-up Sheets is a MS-Excel spreadsheet that is meant to provide you with guidelines to preparation of a fair play line where each player gets equal opportunity to play in the infield and outfield. There are separate sheets for line-ups with 9 to 14 players. What Does COURAGE – CHARACTER – LOYALTY mean to you as a Little League Coach? Did you now that the founding principles of Little League are based on three simple character traits COURAGE – CHARACTER – LOYALTY, that we as coaches are expected to instil in the young people under our leadership. COURAGE… is providing every player with an opportunity to play and contribute to your team in the face of pressure to win. player on your team regular opportunities to start and more importantly to play complete games during the season. CHARACTER… is stepping up to support and be positive with your players when things aren’t going well. Any coach can look good when the team is winning and everyone is happy. Coaches, your true character shows up when a player on your team makes an error in a key situation or when the umpire makes a call that doesn’t go your way during a critical part in the ball game. LOYALTY… is stepping up to defend and support coaching baseball the “Little League Way”. Little League is one of the only youth sports organizations that accepts every player that walks up to the registration table in their community; regardless of their skill, ability and experience. Every player is assigned to a team with a coach, with equipment and uniforms needed to have a safe and fun experience in baseball. Loyalty to coaching the “Little League Way” causes every player on your team to be excited about continuing to play Little League next season. You are the key. Show your COURAGE – CHARACTER – LOYALTY as you mentor our youth. It is inevitable that as an Oakville Little League coach you will be involved in a blowout game. Blowouts will occur over the season, especially when some key players miss games due to vacations or other commitments. These games are a huge frustration for players, coaches, managers and parents. The losing team most likely will not enjoy the game. The winning team will likely loses the mental and physical challenge present in a close, hard-fought, competitive game. In general, blowout games lack the energy that makes Little League baseball so much fun and exciting for all involved. Coaches, players and parents who have to routinely endure blowouts lose a feeling of loyalty to the organization. The embarrassment and humiliation of frequent blowouts can even chase children (not to mention coaches) from the sport, altogether. One of the most important responsibilities of Little League coaches and administrators is to minimize the chances that a blowout will occur. Ideally, every team has a realistic chance to win every game and every team must try its hardest to avoid losing. It is the underlying goal of Oakville Little League to ensure that there is balance at every division of play in our League. Contributing factors include clear and specific assessments of player abilities and experience levels, as well as a fair and organized method for creation of teams. Despite best efforts to create well-balanced teams and schedules, blowouts are still going to happen. The following guidelines are designed to help you as coaches manage in blowout situations, whether your team is trailing or leading in a blowout game. Accept reality – As a Little League coach, you must embody confidence and optimism for your players to emulate, always displaying the belief that your team can come back no matter how big the deficit. However, at a certain point, it helps to acknowledge to yourself that your team is going to lose. Accepting this opens you to creative opportunities to address the situation, some of which, ironically, could lead to your team getting back in the game. Re-adjust goals – Most often, the problem when losing in a blowout is that your team can’t score. Find ways to set achievable goals for your team that don’t necessarily involve ‘outcome goals’ such as scoring. Sometimes that means a goal as simple as getting a base hit or even making contact. Redefine “Winner” – Tell your players that, no matter what the scoreboard says, they can be winners. Establish standards for your players where they know, first and foremost, they’re being judged on their effort, improvement, and on how they respond to mistakes they make. Your young ball players can succeed in these areas regardless of the score. Throughout the game, communicate specific examples of the kind of effort you want your athletes to exhibit, stating tangible measures of improvement, and point to positive responses to mistakes. During blowouts, players may feel alone and exposed, so include yourself in the team’s plight by holding yourself to the same standards of mastery. Model the character traits you want to see in your players; if you keep coaching, they’ll keep playing. Set “Character Goals” – There are only two ways to respond to getting blown out – quitting or persisting. Present these options to your players and ask what kind of people they want to be. Tell them how much you admire people like them, who keep trying even when things aren’t going well. Remind your players that even if was a once-in-a-lifetime occurrence, the Boston Red Sox did come back from that three-games-to-none deficit in the 2004 American League Championship Series. Scramble player positions – Blowouts present a great opportunity to put players at positions they don’t regularly play. This is a great way to teach players an appreciation for other positions and it also gives you a chance to learn more about your players’ skills. Post-game conduct – After a blowout, post-game handshakes can be awkward for both teams. Encourage your players to be proud of their effort. They should feel good about themselves and should stand tall and make eye contact when congratulating their opponents. Prepare your players for post-game conduct by having them rehearse this process at practice. Accept reality – We’ve all seen amazing comebacks. Fear that a team will miraculously close the gap drives many coaches to “keep the pressure on” well beyond what’s necessary to ensure victory. A frantic comeback by an opponent presents a tremendous challenge for your players. How will they respond? Be sensitive to the effect the score is having on your opponents, your players, and on the quality of the game. Avoid humiliating your opponents either by “pouring it on” or by mocking them through overdone restraint. Make adjustments to control the score – Depending on whether your team is dominating from the mound, the batter’s box or on the base paths, focus your adjustments there. Remove your pitcher earlier than you might if they are dominating play. Challenge your hitters to hit from behind in the count or to the opposite field. Stop unnecessary running on over-throws and wild pitches. Only advance runners on walks or base hits. These are courageous acts that will gain respect from opposing coaches, players and parents. Post-game conduct – Stress to your players the importance of respecting opponents by acknowledging their efforts. They should treat the opponent with dignity by acknowledging their effort. Model this for your players as you greet the opposing coaches and players. Once again, they’ll handle this situation more comfortably if they’ve prepared for it during practice. Also, remember not to ignore the efforts that your team displayed. They should be complimented on their accomplishments, as well. If, as coaches, we all follow these guidelines, we will set a positive example for our players, parents and each other that will make the Oakville Little League experience the learning and fun experience it is meant to be.